Renewable Energy division was set up in 1999, as Savita realized the need to invest in clean energy sources. Renewable Energy sources are secure, inexhaustible and sustainable forms of energy that are carbon free and thus environmentally friendly. 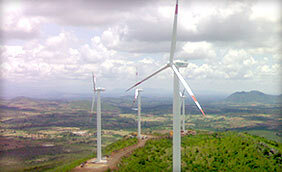 Savita set up its first wind farm at Vankusawade, Satara, which consisted of three 350 KW windmills. Today the Company has a total installed wind energy generation capacity of over 54.15 MW at 18 sites located in the states of Maharashtra, Tamil Nadu and Karnataka. The Company is the only Carbon-Positive Petroleum Specialty Company in Asia. Savita has registered 22.70 MW Wind Power Projects with The United Nations Framework Convention on Climate Change (UNFCCC) under Clean Development Mechanism, which entitles the Company to get carbon credit revenues for a period of 10 years. Savita has also registered 32.65 MW Wind Power Projects with NYSE APX VCS Registry under Verified Carbon Standard (VCS) which is a greenhouse gas accounting program to verify and issue carbon credits in voluntary markets. Savita is proud to be the only Carbon-Positive Petroleum Specialty Company in Asia. With a total installed capacity of over 54.15 MW, Savita generates about 110 Million units of windpower annually. The Baseline Emission Factor for CO2 in the states of Maharashtra, Karnataka and Tamil Nadu is generally between 0.86 and 0.92. This varies from state to state based on thermal power installation in the states. By considering the lowest Baseline Emission Factor of 0.86 and an average Plant Load Factor of 22% (average PLF of all Savita’s Wind Mills), Savita’s Wind Power Plants displace approximately 80,000 tonnes of CO2 per annum against about 3000 tonnes of CO2 emitted through its other activities annually.